Traditional: the boula, playing the central rhythm and the smaller, markeur (or maké), as well as a chak chak (a maracas). Contemporary: boula and maké drums, maracas, conga or djembe drums, chimes and electric bass guitar. Gwo ka played in Basse-Terre. 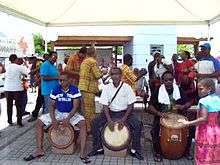 Gwo ka (Big drum) is both a family of hand drums and the music created with them, which is a major part of Guadeloupean folk music. There are seven rhythms in gwo ka, which are embellished by the drummers. Different sizes of drums establish the foundation and its flourishes, with the largest, the boula, playing the central rhythm and the smaller, markeur (or maké) drums embellishes upon it and interplays with the dancers, audience or singer. Gwo ka singing is usually guttural, nasal and rough, though it can also be bright and smooth, and is accompanied by uplifting and complex harmonies and melodies. There are also dances that tell folk stories that are accompanied by the gwo ka drums. Rural Guadeloupans still use gwo ka drums in communal experiences called lewozes; this is the most traditional manifestation of gwo ka in modern Guadeloupe. Gwo ka is also played at Carnival and other celebrations. A modernized and popularized form of gwo ka is well-known on the islands; it is known as gwo ka moderne. Gwo ka is the French creole term for big drum. The origin of Gwo Ka goes back to the period of enslavement in the 18th century. Musical research show that the instrument can find its roots in the drums and songs of the West African countries (Guinea gulf, Congo...). From the diverse music and dance of their homelands, the slaves elaborated a communication tool, a new form of art, like the creole language: the Gwo Ka. This musical genre is characterised by an African typology: - repetitive form - improvisation - physical movements linked to music - a response between a soloist and choir - a syncopation weak times Gwo-ka, is a quadruple entity: dance, music, instrument, song. The influences (lifestyle and musical genre) of the "master" fusioned with this base to create the seven rhythms or dances: the léwòz, the mendé, the kaladja, the graj, the woulé, the padjanbèl and the toumblak. The léwòz is the war rhythm, used to give rhythm the attacks against the plantations, but was also an incantatory dance. The kaladja symbolises the struggle in love. The padjabèl is the cane cutting dance. The toumblak, like the kaladja, deals with the love theme, belly dance, fertility dance. The graj accompanies the agricultural work. The woulé is the "creole waltz", to charm and mimic the whites. The mendé would have been the last rhythm to arrive in the islands with the "Congos" under contract after the abolition. It symbolises the carnival, collective celebration. A more modernized version of gwo ka is gwo ka moderne, which adds new instruments ranging from conga or djembe drums and chimes to electric bass guitar. At root, however, these styles all use the same fundamental seven rhythms as folk gwo ka. Zouk legends Kassav' played an important role in the modernization of gwo ka, giving urban credibility to a style that was seen as backward and unsophisticated; they initially played in a gro ka format, using songs from the gwo ka Carnival tradition of mas a St. Jean and even placing an homage to traditionalist drumming legend Velo on their earlier albums. Gwo ka moderne artists include Pakala Percussion, Van Lévé and Poukoutan'n, alongside more pop-influenced musicians like Marcel Magnat and Ti Celeste, while Gerard Hubert and others have fused gwo ka with zouk. The most famous modern gwo ka performer, however, is William Flessel, whose Message Ka in 1994 became an international hit. In 2013, the Heritage Committee of the Ministry of Culture and Communication has selected the intent to apply of gwoka for registration to the Representative List of the Intangible Cultural Heritage of Humanity in order to enhance the gwoka and organize a network of actors. In 2014, the Heritage Committee recognized gwoka in the Representative List of the Intangible Cultural Heritage of Humanity.